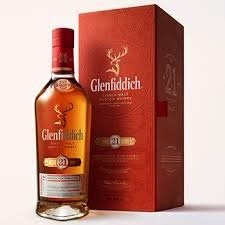 Spirits Glenfiddich 21Yr Gran Reserva - Royal Wine Merchants - Happy to Offer! This exceptional Glenfiddich 21 Year Old single malt Scotch whisky is uniquely finished for up to four months in hand-selected bourbon barrels that once contained rum from the Caribbean, infusing this rare whisky with a rich and indulgent toffee sweetness. On the nose, rich aromas of fig, fudge and hints of ripe banana combine elegantly, while on the palate complex flavors of vanilla toffee and spice intermingle with warm oak and the merest hint of smoke.